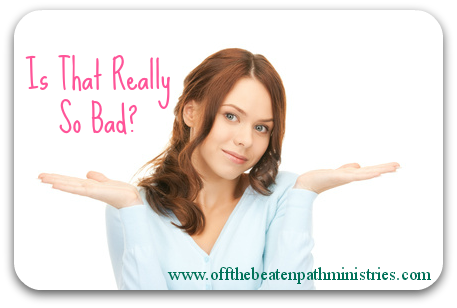 Off the Beaten Path: Complaining - Is That Really So Bad? Complaining - Is That Really So Bad? "I can't believe I have to get these eight interviews whittled down to a 750-word article!" I complained...more than once...to my friend, my husband, my dogs! I even posted my whining (complete with photo of my copious notes) on Facebook. Just days ago I complained not once, or twice, but multiple times about the work I had to do. And I didn't just complain to other people (or my dogs), but I had the audacity to complain to God. "God, this is too hard," I whined. "How does my editor expect me to write this article so tightly! There's too much...it's too hard...I'll do it later...blah, blah, blah..."
And then, praise the Lord, I heard my petulant, cantankerous complaints ringing in my ears. And I was offended. I was appalled. Do you have a problem with complaining, too? I wouldn't call myself a complainer if you asked me to describe myself to you. But sometimes my actions prove otherwise. But is complaining a little here and there, especially when it's "good-natured complaining," really such a bad thing? Does it really hurt anyone or anything? But while God may not have considered Job's complaints to be curses against Him, He did later reprove Job for his whining. In Job 38:1 God answers Job's litany of complaints with something akin to, "Who is talking about things he doesn't know anything about?" And later, after a similar rhetorical question, God asks this stripped-bare man, "Will you really annul My judgment? Will you condemn Me that you may be justified?" In other words, God reminds Job that He is God and Job is not. Ouch! Is that what my complaining indicates? I had no idea! You either? When we complain we testify to the world around us about our God. That's right. No, we don't testify to His goodness, provision, grace or love. But we whine that He is in fact insufficient, unfaithful, unloving and uncaring. Is that the kind of testimony we want to share about our God? Of course not. But I've found that complaining comes more from habit than contempt in my life. I know better than to complain and certainly do not mean to testify negatively about my God, but I whine out of habit. It's a nasty trigger response to life's little inconveniences. You, too? Begin the day with a grateful spirit. Spend time praising God and counting my blessings at the top of the morning. Look for opportunities to give thanks when my default would normally be to murmur or complain. Ask the Lord to build a new spirit of thankfulness in me, uprooting the spirit of ingratitude. Examine the areas in which I normally complain (for me that's my work, my dogs, my family, my finances) and conscientiously, proactively bathe those areas of my life in thankfulness instead. Seek accountability. I'm confessing this sin to a couple of people in my life (well, and all of you, of course!) and asking them to correct me when I begin to whine. Those who tolerate sin in what they think to be little things will soon indulge it in greater matters. What have you been complaining about that you need to replace with praises and gratefulness instead?